Grave marker for Joffre D. Collier in Riverview Cemetery, East Stone Gap (Wise county), Virginia. Joffre, who preferred to be known as "J.D.," enlisted in the Army at Richmond, VA on 17 October 1942. On 29 October 1942, Pvt Collier was transferred from Camp Lee, VA to Company B, 508th PIR. Pvt Collier was wounded in action in France on 8 Jun 1944 and evacuated to a field hospital. He returned to duty on 4 September 1944. Pvt Collier was appointed to Corporal on 1 November 1944 and to Sergeant on 4 September 1945. 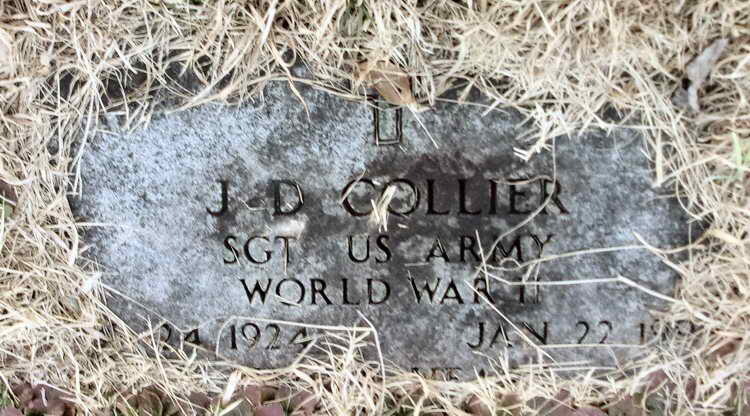 Sgt Collier was wounded in action in Belgium on 7 January 1945 and returned to duty on 13 March 1945.